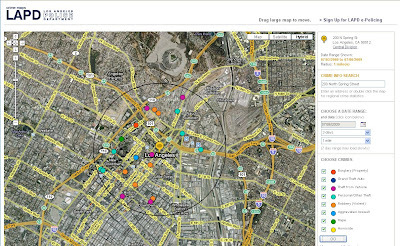 In April of this year, the Los Angeles Times began to notice problems with the interactive online version of the official crime map put out by the LAPD. First, there was an item called "Highest crime rate in L.A.? No, just an LAPD map glitch" in the newspaper, and this month they pointed out that "LAPD's public database omits nearly 40% of this year's crimes." The police chief has blamed the vendor and praised the newspaper in his public announcement, although "Bratton says LAPD's crime map will stay online." LightRay Productions is one of the companies involved in the snafu. Yet it still boasts of its effectiveness creating crime maps for other cities, like Dalton, Georgia and West Vancouver on its company blog. The other vendor who has been named, PSOMAS, seems to be adopting a lower profile, although it does have a portfolio of very different kinds of mapping projects here. Bratton drew a clear distinction between the public map, which he continued to describe as one of the best in the United States, and the internal CompStat reports used to evaluate trends and guide deployment, which he insisted are of the highest integrity. The Times discovered the magnitude of the problem while developing its own online map to display LAPD data. While the department's official crime tally recorded more than 52,000 serious crimes from Jan. 1 through June 13 of this year, the public mapping site contained fewer than 33,000 for the same period. As the Los Angeles Times emphasizes its own Internet mapping efforts in an attempt to improve flagging readership numbers, after several years of disastrous attempts at "interactive content," it is interesting to see how they are situated in the story.